Modern Twist: Contemporary Japanese Bamboo Art celebrates the intricate work of professional bamboo artists living in Japan, whose evocative, sensual, and sculptural pieces explore innovations in bamboo art since the mid-twentieth century. Timing: Wednesday though Saturday from 10 a.m. to 4:30 p.m. | Sunday from 12:00pm to 4:30 pm. 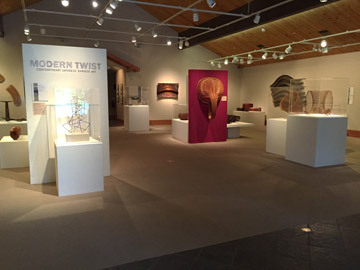 Modern Twist features examples of both Japanese and Pomo pieces by master weavers that together span over one hundred years of textile arts. The artworks were chosen by Dr. Andreas Marks, Minneapolis Institute of Arts, from the collections of the Clark Center for Japanese Art and Culture in Hanford, California. “These are two of the best basketry traditions in the world. We thought it would be fun for people to be able to compare them side by side; in doing that they can be appreciated for their differences and the similarities” – says Grace Hudson Museum Director, Sherri Smith Ferri. Ueno Masao, Rotation of Ellipse Makes Two Transparent Drums, 2004. Bamboo (madake), rattan, lacquer, and gold powder. Photo by Susan Einstein. Mimura Chickuhō, Hope (Detail), 2004. Bamboo (madake), rattan, lacquer. Photo by Susan Einstein. Bamboo is a quintessential part of Japanese life and the Japanese have used this extraordinarily strong and flexible grass for centuries. It is an extremely challenging medium, with less than 100 professional bamboo artists in Japan today. The exhibition features 17 of these artists, including two men deemed “Living National Treasures” by the Japanese government in recognition of the excellence of their work– Katsushiro Sōhō and Fujinuma Noboru. Jiro Yonezawa, the current artist in residence at Slow Fiber Studios ( a program of World Shibori Network) is also a featured artist at the show. Uematsu Chicuyū, Ascending to Heaven, 2007. Bamboo (madake) and rattan. Photo by Susan Einstein. Nagakura Ken’ichi, Circle, 1990. Bamboo (madake), lacquer, powdered polishing stone, and clay. Photo by Mochizuki Akira. This entry was posted on 11 August 2015 by World Shibori Network and tagged bamboo, bamboo basktery, grace hudson museum, jiro yonezawa, modern twist, pomo basketry.